t subjunctive in Spanish has its special set of endings as indicated on the chart on the left. Notice that the endings are mostly “reversed" from their present tense indicative endings. We add these endings to the “verb stem" in the yo (first person singular) form. 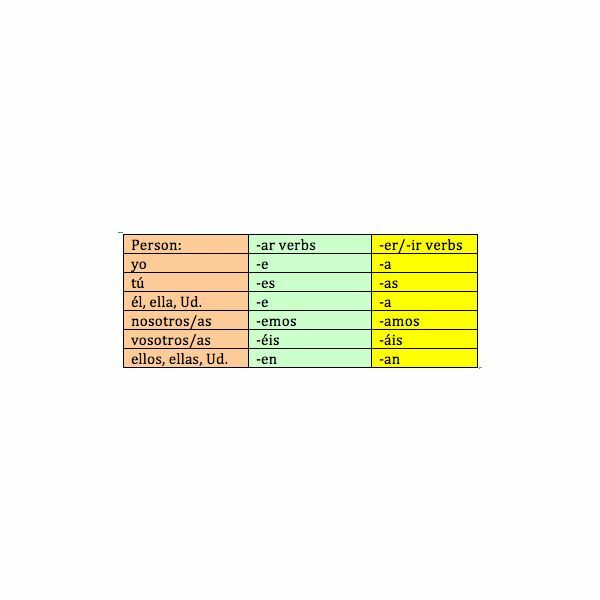 The “verb stem" in Spanish is what we have left when we remove the verb ending. So with the verb hablar, the verb stem in the yo form (hablo) would be habl-. So we just refer to the chart and add the appropriate ending. 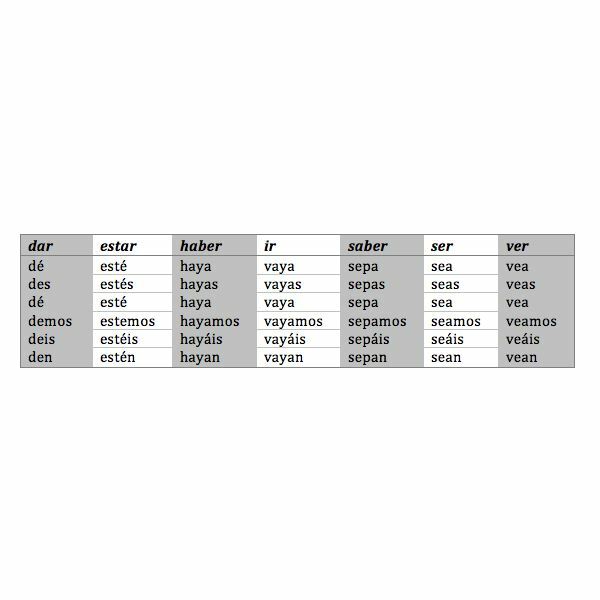 Since hablar is in the -ar family, we add the first column endings. Es important que tú hables bien. It’s important that you speak well. Many Spanish verbs have irregular forms in their yo (present tense, first person singular) form. 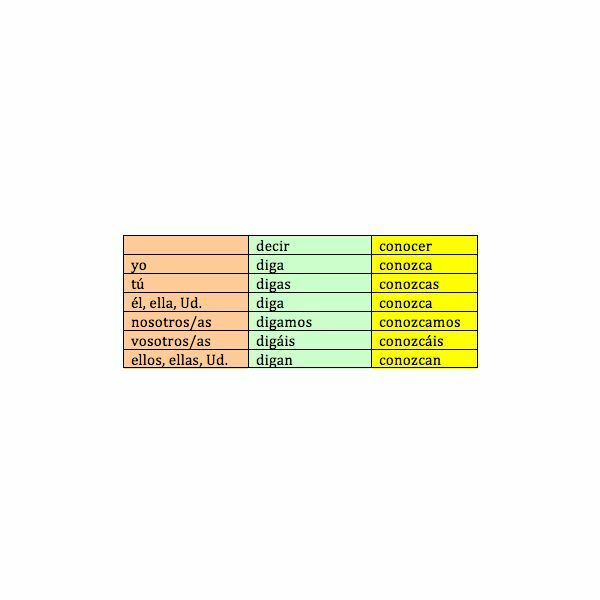 Here’s where knowing how to conjugate Spanish verbs helps. For example, we have digo (from decir) and conozco (from conocer). For the Spanish present subjunctive, just add the appropriate endings to the irregular yo form and maintain the pattern throughout. A few Spanish verbs are irregular through the present subjunctive. Spanish uses the subjunctive more extensively than English. Es necesario que compress el boleto hoy. It is necessary that you buy the ticket today. Es bueno – It is good. Es importante – It is important. Es imposible – It is impossible. Es malo – It is bad. Es mejor – It is better. Es Necesario – It is necessary. Es una lástima – It is a shame. Es urgente – It is urgent. ♦ With verbs of “will and influence"
Yo quiero que tú digas al medico. – I want you to speak to the doctor. Me gusta que tengas una actitud positiva. – I’m glad you have a positive attitude. ♦ With verbs of “doubt or denial." Necesito un libro que tenga artículos sobre nutrición. I need a book that has articles on nutrition. Hay unas vendas en el botoquín en caso de que las necesites. There are some bandages in the first-aid kit in case you need them. Spanish verbs come in two moods: the indicative (stating the real) and the subjunctive (stating the hypothetical or wishes). This series is all about the subjunctive, which Spanish uses much more extensively than English.